I could no longer resist the Multidirectional Diagonal Scarf by Karen Baumer. I've seen so many of them made by different bloggers and I thought it looked kind of neat. 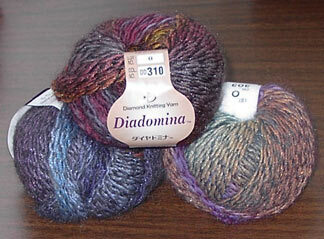 Then when I got the Diakeito Diadomina at ThreadBear I thought it might be a good pattern for this yarn. Little did I know how much fun it would be! I'm just loving it. Thanks for the great pattern Karen!! And thank you to Tracey at New York Knits for the great package that she sent to me. It included Silk Garden, Iro and Kureyon and I can't wait to get started playing with it. 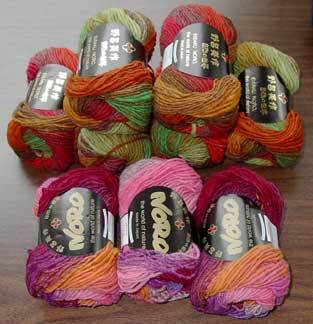 I've never tried Silk Garden or Iro before, so I'm sure I'll be knitting up something soon! Thanks to Tracey also for featuring Black Sheep Bags right on her front page! I was excited to see that she has online ordering available for my patterns because I have been getting a lot of requests for this. Very cool! I've also been working on my Keepsake quite a bit. I'm working my way through the fourth color, I'll try to remember to take pictures after I start color #5. Have a great weekend and Happy Knitting! Well the Amanda Backpack patterns are back from the printer's and already on their way to yarn shops across the country. I sent a bunch to ThreadBear and they have generously offered to do kit pricing for a limited time! Three skeins of a solid color of Cascade 220 plus the pattern for for $20. Four-color striped bag kits for $25. To take advantage of this great deal, just drop them an email at orders@threadbearfiberarts.com. Thanks for the great offer guys! And good luck in your new home in Lansing, MI! If you are a yarn shop owner and are interested in carrying my patterns, or you would like your local yarn shop to carry my patterns -- please email me. And if you are interested in purchasing the Amanda Backpack pattern and would like to know if it is available at your local yarn shop, please visit my Where to Buy page. Thanks so much!! On Saturday, Theresa journeyed out to Joliet to see the new house and do some knitting. I finished up the last Amanda Backpack and decided to start a fun little project. 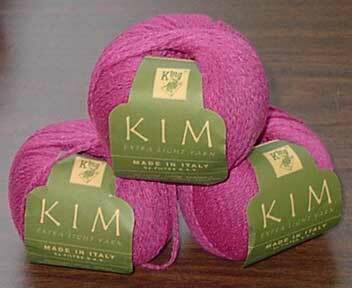 So, I cast on the Kim that I got at ThreadBear a few weeks ago. 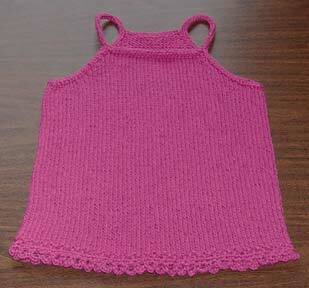 After figuring out my gauge, I worked up a pattern for this tank for Maddie. It's a simple little tank knit in the round with an i-cord bind off, applied i-cord around the arms that turns into straps, and a decorative seed stitch/crocheted bottom edge. I think it turned out pretty cute considering that I was winging it. Here's Maddie, just post nap, trying it on. And. . .
And here is a cute shot that doesn't show off the tank very well, but what the heck. So, what's next? I have another design that I need to work on -- the Heidi Tote. But I'd like to get in some work on my Keepsake and Ingeborg. (Poor Ingeborg -- so pretty but so neglected!) And there's that Diadomina that I can't wait to try. Decisions, decisions! I have been knitting, really I have. And finally I have proof! 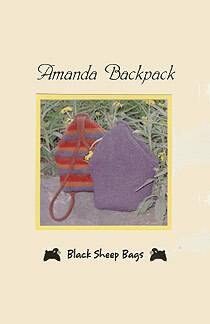 Here is the cover picture for the latest Black Sheep Bags design -- The Amanda Backpack. It measures approximately 6 1/2" X 7" X 12" and uses three skeins of Cascade 220. I'm taking the pattern in to the printer's this week and will be printing photos and assembling patterns all weekend most likely. So next week I will be contacting all my current retailers and shipping out patterns to them. *Please* help me out! If you like my patterns and would like your local yarn shop to carry them, let me know! Or let them know about my website (www.blacksheepbags.com), or give them my email (Julie@blacksheepbags.com). And thank you to everyone who has bought my other patterns! I really appreciate it!! Almost two years ago I started blogging. My first blog -- Craft-a-holic -- was on Blogger. Then I decided to change the name and re-do the entire blog, so I started Booga J and continued on with Blogger. When I switched over to TypePad as a beta tester and now a regular user, I never imported my posts from my first two blogs. I have absolutely no idea why I decided to do it tonight, but I have imported all the posts from those blogs, so now everything is in one place. My archives are finally in order and it really wasn't very difficult. I followed along with the instructions that TypePad provided and it took almost no time at all. First off we have some Kim in color 494. 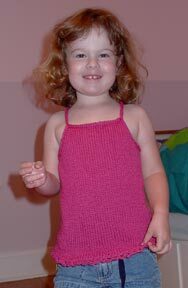 Maddie picked out the color which is for a tank top I am going to knit for her. (She is developing a love of yarn equal to my own! I can't wait until she is old enough to learn to knit!) No pattern, I'm just going to make it up as I go along. I can't wait to finish my last Amanda Backpack so that I can start on this project. And next we have. . .
Diakeito Diadomina in three different colors. The guys at ThreadBear had a scarf knit with this yarn that was the *softest* thing you can imagine. I'm planning on making a simple scarf with it but haven't decided on a design yet. The label suggests US7's and a gauge of 20-22 X 25-27. Any suggestions? I have 366 yards altogether. Today I walked . . .
That's Kureyon in colors 130 & 75. Maddie picked out the 130 -- she's such a girly girl :) & I picked out the 75. Orange, green, brown and red -- can it get any better?!? I haven't gotten as much knitting done because I have been doing a lot of house and yard work. Over the weekend of the 4th, Pete and I put in a flower garden. 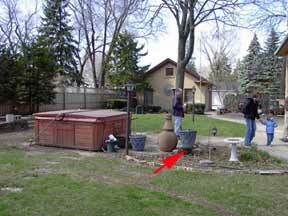 Here's a shot from when we were looking at the house back in April (all "stuff" including the hot tub belong to the previous owner). We put in a gorgeous hydrangea in the center. 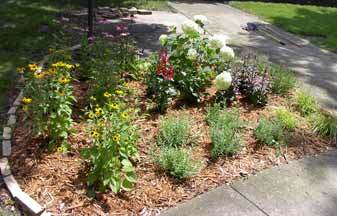 On the east side are purple coneflowers and black eyed susans. To the north, facing the house, is a patch of lavender -- this smells *wonderful* -- and behind that is red cardinal flower and a purplish sedum. 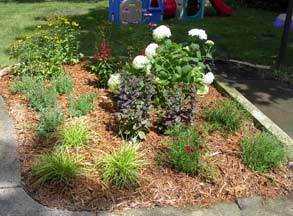 And to the west is an ornamental grass (I forget the name) and some ruby coreopsis. Lots of other yard work has been done, but it mostly involved trimming bushes and pulling weeds, so I won't bore you with the details. On the knitting front, the second Amanda Backpack (actually the 4th I have knit!) cover model is coming along nicely. I really think that there is a possibility that I may have the pattern ready for release later this month or in early August. 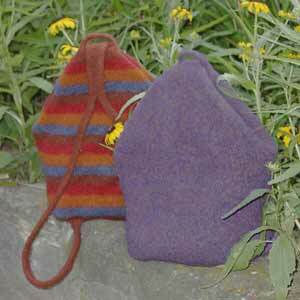 but I suspected that when I opened the Knitting Blogs Webring again, I would be hit with an avalanche of new members. Which also means a lot of questions and such. But I've vented about that on the Knitting Blogs homepage, so I'll avoid it here. I have been knitting in every free moment that I find. I completed the final version of the latest Black Sheep Bags design -- the Amanda Backpack. Now I'm just knitting up the two cover models. Above is the first of the two. I had the great pleasure of stopping by ThreadBear a couple of weekends ago when I was down in Indy for Pete's family reunion. While I was there Matt helped me pick out these colors. Very autumnal, don't you think? And Rob -- I've been working on my Keepsake too! But not not as often as I would like. I'm up to color number three. 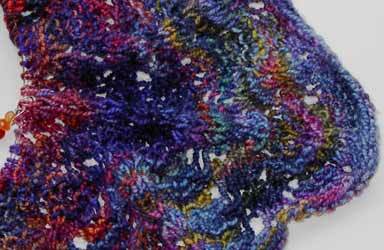 This design is as fun to knit as Charlotte and I would recommend it to all Koigu addicts! We are also settling in to the new (old) house which is taking a lot of effort, as you can imagine. However, I think that I am finally starting to settle back into a bit of a routine, so hopefully I will have more time to blog -- and not just on the Knitting Blogs Webring site! More on the new house this week!